Stainless steel is known to be corrosion resistant, making it today's most used material for manufacturing door handles. The corrosion resistance of stainless steel is because of a chromium-rich oxide film. The chromium-rich oxide film is created by a reaction between the chromium found in stainless steel and the oxygen in the air. If the surface of stainless steel door handles aren't regularly cleaned then small deposits on the surface will prevent the passivation process and reduce corrosion resistance. Therefore, to keep the highest level of resistance and aesthetic appeal it is necessary to keep the surface of stainless steel door handles clean. Stainless steel door handles are easily kept clean, internal and external door handles should be cleaned regularly to improve appearance whilst retain corrosion resistance. Cleaning can be done by wiping the surface of the handles with a warm clean cloth using either a mild detergent or soap, before rinsing with clean water and drying with a towel. If there are stubborn stains or spots on them a mild non-scratching cream cleaner or polish could be used, these should be suitable for use on stainless steel and must not contain chlorine or other abrasive chemicals. Applying cream cleaners or polish can be done with a soft dry cloth or sponge and similarly to above cleaned off with warm water and dried with a towel. Steel brushes or wire wool should not be used on stainless steel handles as they can scratch the surface and leave deposits behind resulting in surface rust. We recommend that your stainless steel handles are cleaned at least once a month. 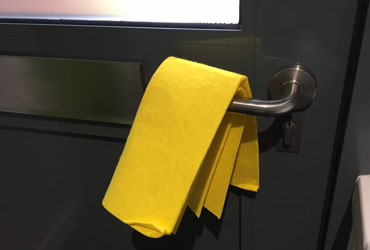 In offices or commercial premises where handles receive more frequent use or when exposed to changeable atmospheric conditions cleaning should be increased to once a week. Should stainless steel door handles discolour, this is usually because cleaning is inadequate. Both grade 304 and grade 316 stainless steel handles should never be cleaned with products containing chlorine or other abrasive chemicals.